Mom, the Intern: Waiting games. Confession: I secretly hoped that by posting my 38-week belly shots, I would go into labor soon thereafter and wouldn't have to address the fact that I'm still pregnant this week. Even though I'm not technically 40 weeks along until Sunday, I feel overwhelming pressure to get this baby out. This is because about two weeks ago, I started receiving well-meaning but stressful comments from all sorts of people about my impending delivery. Things like, "You're still here?!" at church functions, cashiers asking when I'm due because I look like I'm about to pop (gee, thanks), even people straight-up asking when I think the baby will be here ... yeah. If I knew, I would gladly tell you! I should try to find the comments funny, but it eventually gets irritating and then very frustrating. Especially for me. I like to have control over things of this nature. I'm currently pretty uncomfortable and I want to meet my baby. And I'm hyper-aware of the fact that I'm VERY pregnant. Others pointing it out to me does absolutely nothing to quell my anxiety about the birth. So, here's an update, in case you're among the curious. The deal is this: Saturday, the day before Easter, I finally started having real contractions. Not super-consistent or painful, but strong and different from the Braxton-Hicks ones I've had all along. Easter was a lovely day and we were able to celebrate Christ's resurrection with our families. I also hit my 39-week mark that day. I had a few sporadic episodes of contractions, but nothing very serious or worrisome. 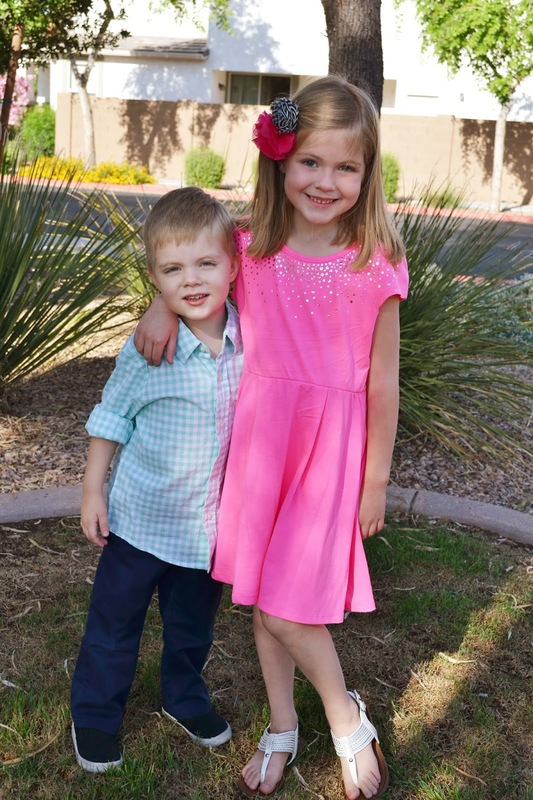 Behold, my cute kids on Easter Sunday before heading to church. This continued on until Monday night, when the contractions actually picked up in frequency and strength. I figured it must be very close to "go-time." I got out the yoga ball and went into The Zone. I knew I had an appointment with the midwife the next morning. If I made it to that appointment, she would check me and tell me how far along I was. If I didn't, I'd have a new baby! The contractions lasted for a few hours and then died. There was a short resurgence in the early morning hours, but ultimately they died off, too. So when Dill's alarm went off, I told him to go to work and I'd let him know what the midwife said later. I did get checked at my appointment, and the midwife found me in a favorable position to give birth soon (yay!). My cervix was soft and 60 percent effaced, dilated 2 centimeters and Baby's head was at a -1 station (very low, which I already knew). She told me to rest and get ready to have the baby "today or tomorrow." Positive news that put me in great spirits. "Jenna ... Audrey just threw up!" And with that, labor came to an instant, screeching halt. Survival mode time. I hoped that puke-isode would be an isolated deal, but it wasn't. She continued to throw up all afternoon and night for about six hours straight. She'd been hit with The Plague. The one rife with vomiting and diarrhea that's currently taking over the entire world's social media feeds. There was no way around it. Only time would tell how many others in our household would fall victim. Now, not only was I waiting for Baby, but also waiting to succumb to the unholy symptoms of The Plague. Surprisingly, Audrey recovered well and was mostly back to her normal, chipper self by yesterday morning. She stayed home, rested some and got her strength back fast. I also lost my mucus plug in full, meaning labor could really start any time. Our little roller coaster was on its way up again. Just a quick-moving stomach bug with a single victim! Nothing we can't handle, I mistakenly thought. This morning at 1:30-ish, I was rudely awoken by the unearthly sounds of a grown adult (Dill), in our master bathroom, in full Plague expulsion mode. I won't go into further detail. You know exactly what this means and so did I. So here I am, walking around in early labor that keeps stalling because Baby and I are waaaaay too stressed about The Plague, worrying endlessly that Carson is next (he's not exactly an expert at vomiting which means I will surely be cleaning up anything his body decides to eliminate) and mostly trying not to imagine myself in full-blown labor while battling the --forgive me -- pukes-and-scoots. Because seriously, that would be the death of me. 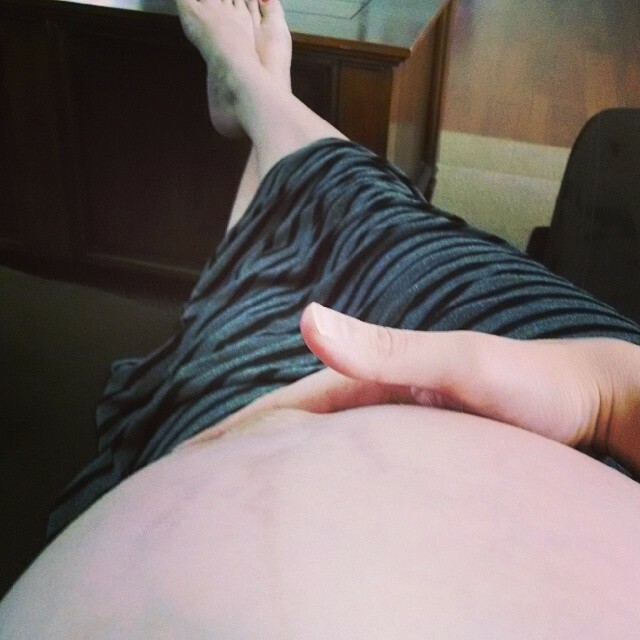 Anyway, I snapped this shot of my ripe belly yesterday while lounging on the couch. As you can see, the belly button is in full deployment mode. I wish all I had to do was push it to get the ball rolling! Hopefully the next time I post, it will be about a cute little baby girl who has decided it's finally safe to join our family, and NOT about the Foote Family's Bodily Functions. Because I'm pretty sure 93 percent of those who started this blog post closed the tab before making it to the end, thanks to all the potty talk. Those last two weeks are KILLER. I'm so sorry things aren't going well right now. I keep thinking about you and your first two deliveries weren't awesome (to put it mildly...) and hoping this one is a breeze. Best of luck! Thanks Elise! I hope so too! At least all the sickness riff-raff is taking my mind off the fear of childbirth. You still haven't had the baby?!? Haha just kidding. At least you produce adorable kids so a cute baby is guaranteed at the end of all this. It's true; they're cuteness makes it all worthwhile! Well, you could always go to McDonalds and get that $1 spicy chicken sandwich like when you were pregnant with Carson, but on second thought don't because I can't imagine anyone eating that sandwich and then getting the crud from H*LL. That woudl be WAY too much!!! Amen, Janice! Let's not even go there! Haha! Oh girl!! I'm SOOO sorry about The Plague! Dude that thing is KILLER! But if you can keep the infected one isolated ish then it should pass! I was in isolation for 4 days when I had it, so I'm hoping you and Carson get to skip it cuz Andrew and Rory didn't get it when I had it! :/ GOOD LUCK!! When I was pregnant with you and your twin Josh, someone actually pointed at my stomach and laughed out loud!! I was not laughing at all. I stared back and almost started to cry. Before you know it, you'll be all night with precious newborn! I'm dying to find out how this story ends! !